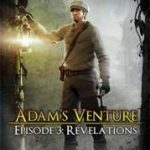 Adam’s Venture, Episode 3: Revelations (Retail $16.00 on Amazon), from Iceberg Interactive, is the third and final installment in the Adam Venture series of PC adventure games. This series, set in the early 1920’s, focuses on non-violent solutions to situations, and challenging puzzles based on patterns, math, and logical reasoning. This episode picks up exactly where the second left off: with Adam unconscious in a collapsed temple ruins, and his companion, Evelyn, being taken captive by a power hungry megalomaniac. Over the next several hours of game play, you’ll flash back in time to Adam and Evelyn’s first meeting, and the mystery that brought them into contact with the sinister Clairvaux Corporation. When you regain consciousness in the present, you’ll have to rush to solve puzzles and navigate mazes in order to defeat the head of Clairvaux and save your dear friend. Meet a few new characters, including Adam’s father, visit stunning locations, like an old Templar graveyard, and face off with your nefarious nemesis one more time. The first 2 games in this series were quite enjoyable, and I love how each one ends by leaving you wanting more. This game is no different, except that it wraps up the story line instead of leaving you hanging on until the next episode. I really loved meeting Adam’s father, and discovering that Adam and Evelyn’s bantering stems from their very first moments of acquaintance. 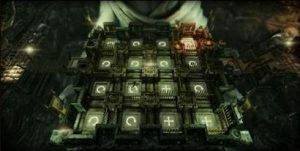 The puzzles increased in difficulty with each consecutive level within a puzzle type. 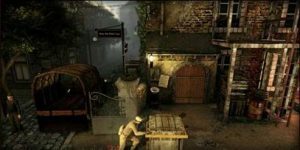 For instance, you might encounter a string of doors, locked by a mechanism based on patterns. 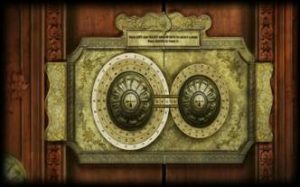 The first lock might be relatively easy, letting you get a handle on that style of puzzle, but by the 4th lock, you’ll actually have to get your little gray cells working overtime to beat it. This cuts down on the variety of puzzle types, but definitely presents a challenge. 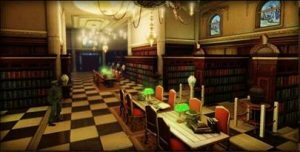 All of the locations you’ll visit are beautifully rendered in detail, and make wandering around a pleasure. The ambiance is also enhanced by various different weather scenarios, as well as by the stunning composed music. It’s also pleasant to know that you aren’t being timed and that nothing is going to jump out and, well…jump you. My only complaint with the title is that, for an adventure game, it’s fairly short. I could have wished for a few more hours of game play, and maybe a bit more leeway to explore outside of a specific sequence of events. However, this is still a game that is worthy of any adventurer’s time, and one I feel confident in recommending to anyone who likes a good puzzling brain workout. Sadly, this is the last installment in the Adam Ventureseries, but we can hope for a whole new adventure series from Iceberg Interactive in the future. In the meantime, be sure to check out all of their exciting titles at www.iceberg-interactive.com.